Our adjustable front end mounting kit is great for virtually all types of fiberglass front clips. Included in the kit are all brackets and tabs needed to make the braced front end tree for a fiberglass clip. Introducing our all new removable dual parachute mount! Based off our long standing single chute mounts, we have had numerous customers looking for the same simple design but for their cars that have and/or are needing to parachutes. We incorporated a little bit of our rod style dual chute mount with the easy to remove single mount. All made of chromoly, and tig welded, these mounts are the most compact way of installing dual parachutes on your car. Our latest innovation to come out of our doors is our new extreme adjustment 4-link brackets! We came up with this specifically for the racer whose car needs that fine tuning to maneuver their way down the track. Needless to say, we are talking about your on the edge, high horsepower, and small tire race cars. We've designed these brackets with inserts so you can tune the suspension with even more precision. Included in the kit are inserts that allow for 4-link bar changes up to 1/8". 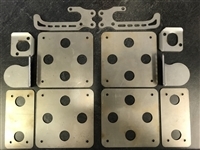 With this kit, you will receive 4 brackets and 8 inserts for the brackets, which allows for you to be able to make a 4-link change in smaller increments than ever before, and without really having to mess with pinion angle, and bar length. Grade 8 bolts, nuts, and washers are also included. Kits are available now! Introducing our new rear end, the Megatron 9" housing! We've developed a rear end specifically for applications in which multiple tire sizes are run, like radial cars that also jump into the pro mod or 10.5 classes! Now there is no need to swap out rear ends and completely change setups on cars, our Megatron housing works for them all! Compared to many of the leading housing manufacturers, ours are better braced and stronger, as well as priced much more reasonable! Housing comes as a complete piece with 4-link brackets welded on, all bracing added, and our adjustable shock mounts. $2,450 for housing with standard housing ends. Introducing our redesigned 4-link dragsters! Our 4-link designs have been proving themselves for over 20 years now, and continue to do so today. With an updated look, and more modern features including a new generation dash, an interior glovebox, and compartments for other tools, our new dragsters are ready to take you to the winners circle at the next big money bracket race, National Event, or Divisional race. 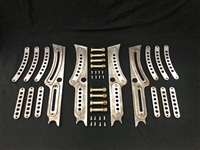 One things for sure, you will be extremely happy that you chose Advanced Chassis to build your newest piece to your sportsman racing operation. We can finish your dragster however you want it, from base to complete turnkey ready to go hunt for that big check! Introducing our new 9" planetary rear end designed for some high horsepower tractor pulling, and other applications too! 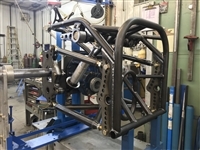 This rear end has been produced to take the stress of high torque off the drivetrain, and distribute it out through the planetary and to the ground. 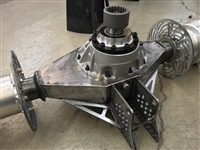 These housings are designed by Advanced Chassis and the rest of the rear end has been developed through AC and Modern Machine.